1. For the first time in 4 years since I’ve been running races, I was able to stay in tune with my body every step of the way and ran based on how I felt, not time. My training already determined the time I was going to run, the actual race was just the final piece to tie it all together. 2. I don’t know how to run the tangents well. 3. I ran a personal best by 10 minutes. 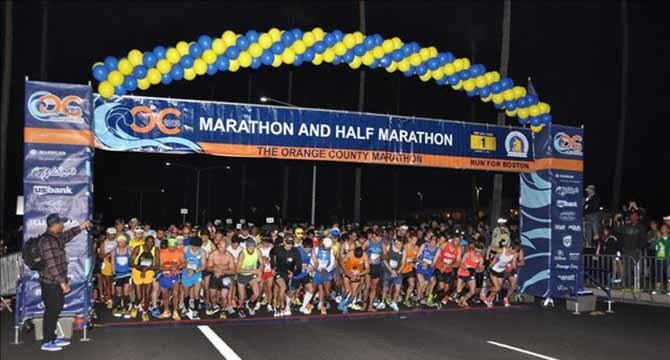 If you’ve been following along, I decided to run the OC marathon kind of last minute. 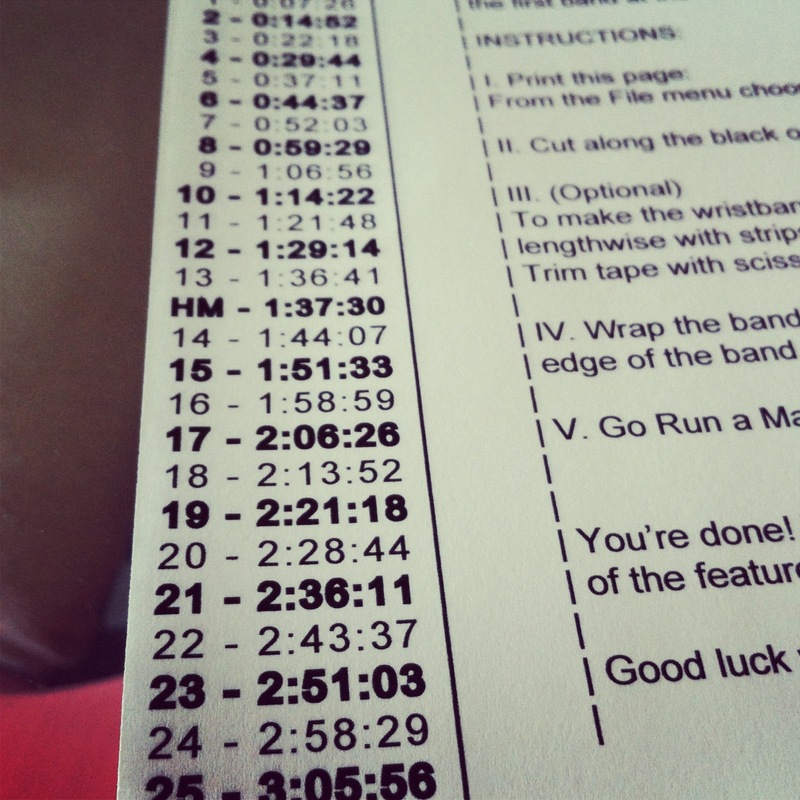 I wanted a spring road marathon to see where my running level is currently at, so I created my own 1 month to a marathon PR training schedule (do as I say not as I do). Since I only run one road marathon a year, I wanted to really go for something big. My last marathon PR of 3:29 was at Santa Barbara in 2011, I was a couple seconds off that PR in Eugene last year. Going into the race, I didn’t have much of a strategy. I randomly picked 3:15 because it sounded good, but knew in the back of my mind that I haven’t been training at 3:15 pace on my long runs. It was a lofty goal and I was never able to fully execute that pace during my training. My only plan was to go out slow, take the first 3-5 miles to warm-up then try to negative split the course. Matt would jump in at Mile 12 to pace me to the finish. If all the stars aligned that day, I would come out with a PR, hopefully a significant one. The race started at an ungodly hour of 5:30AM. The only races I have done that started that early are the Disney World races and Northface 50 miles. Matt dropped me off at the start, Fashion Island, where I warmed up a bit, got situated near the 3:15 pacer and tried to relax. I had been a nervous wreck going into the race. There is something about road races that are so much more intimidating than trail races. The size of the field, having my friend’s track me, the pace that I would have to maintain, the “no walking” rule and the high expectations I was placing on myself all contributed to my anxiety lining up at the start. I met up with my friend Neil and saw Matt again who found parking and came to watch us start. I had asked him what a 3:20 pace would be and thinking that pace was more realistic for me, but I would still try for that 3:15 if a miracle happened (which they never do on race day). I wore a 3:15 pace bracelet that I had made the night before to remind myself of splits I needed to hit throughout the race. I asked the 3:15 pacer if he planned on running even splits from the beginning and since he was, I would start out behind him. There was no 3:20 group, only 3:25 so it was nice to run alone and not part of a big group. I needed those first few miles to warm-up and was fairly confidant I could make up that time later on in the race. The first six miles were very fast, making it hard to start slow and not let my adrenaline take over. I kept the 3:15 pacer in sight, but didn’t worry too much when I couldn’t see him. I knew I needed 3-5 miles to warm up so when my watch clicked off 7:35 splits instead of the 7:26 I was supposed to be running, I wasn’t worried at all. My shins from the get-go started feeling sore which was strange. I had a flashback to my last short run on Friday where I had a similar problem, yet I couldn’t figure out why it was happening as I was wearing my favorite shoes and had been tapering all week long. I pushed the negativity out of my mind and figured if need be, I can push through shin pain, though it wouldn’t be pretty. I enjoyed the scenery, took note of any female runners around me (there weren’t many), and focused on warming up. I would give myself 5 miles before I would start picking up the pace. 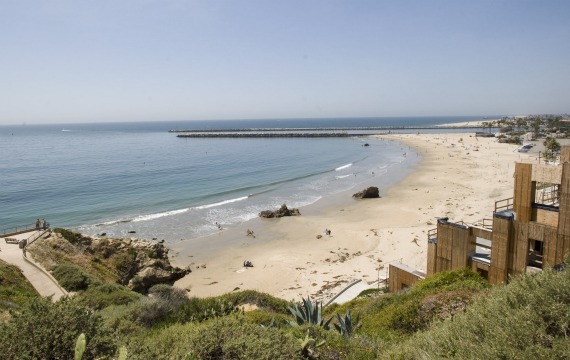 We were greeted with breathtaking panorama views of the Pacific Ocean, winding through the seaside village of Corona del Mar and cliff side views of the beach. After Mile 4, my shin pain went away and I was starting to have fun, never glancing at my watch or my 3:15 pace bracelet from then on. I was determined to run this race based on how I felt at that moment. As we winded into the nature preserve, I overhead an older runner with another women discussing their pace behind me. The women ended up ducking into a porta potty and I ended up running with the guy. He was steady and running practically the same pace as me. 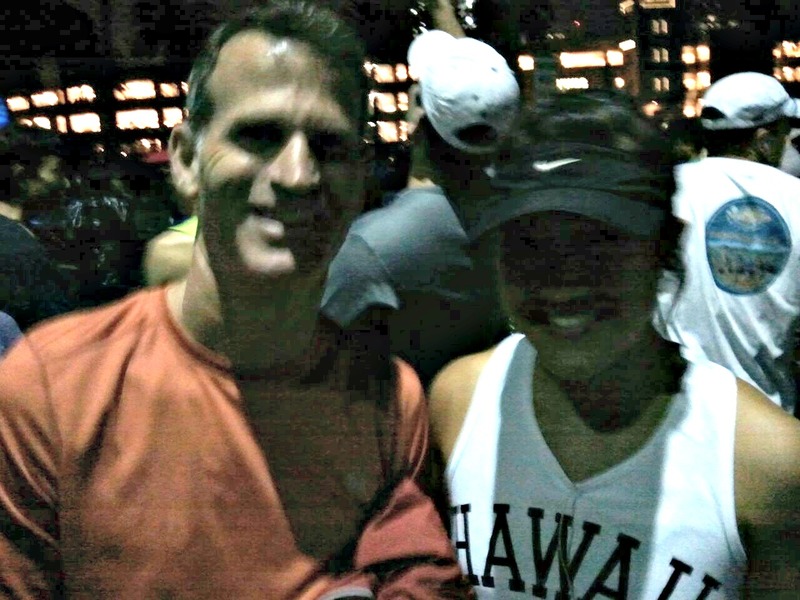 We were running so close together we were almost rubbing elbows. I finally told him what a great pace he was holding and asked what he was shooting for. He didn’t seem to speak much English and grunted out a 3:20. I figured since he was running so steady, I would stick with him until Matt jumped in. The next 6 miles I stayed steady with the runner. He saw that I was clinging onto him and instead of trying to shoo me away, he took me in and basically told me I had no clue how to run tangents. I never realized it until he started pointing how many extra steps I was taking. He didn’t speak much, just made hand signals at me to follow him or run closer to the side to cut any corners we could and run the most direct way possible. It was nice having someone literally right next to you, matching your every footstep. We passed runners left and right, clocked the miles off one by one and not once did I worry about my pace. I knew we were running good splits and I wanted to make it to Mile 20 with enough gas left in the tank. 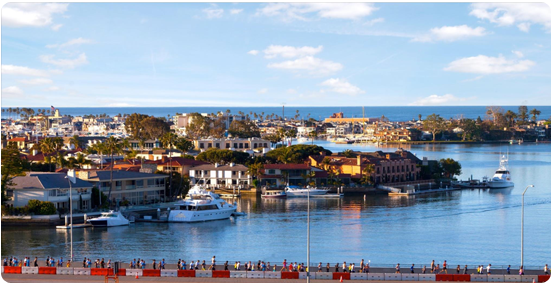 We traversed down Bayside Drive, past the yacht clubs and big homes and boats of Newport Harbor. It was surprisingly calm and beautiful. I didn’t mind not having many spectators, I’m used to it on the trails and prefer it that way. We ran along the bluffs overlooking the Upper Newport bay Estuary Reserve which was probably my favorite part of the course. Matt jumped in at Mile 12 and all three of us ran together for a little bit before Matt and I broke off on our own. I knew the second half of the course wouldn’t be a scenic as the first so I saved turning on my music until I really needed it. The scenery changed from cliff side views of the ocean to industrial buildings and freeways. I was feeling great and it felt like one of our regular weekday runs. Stay focused, be present, pay attention to your nutrition and constantly ask yourself what you could do to make yourself feel better (ultra mentality). There were a couple boring straightaways where I could see for miles, so I just kept my head down and stared at the backs of other runners. There was a significant 45′ incline at mile 14.5 over the 405 overpass. Matt told me to take quick small steps which stayed in my mind every time we hit a hill. At mile 15 we had a short out and back and for the first time, I saw that the 3:15 group wasn’t that far ahead of me. Seeing them gave me confidence that my legs will run their own natural pace. Miles 16-20 I started to feel myself lose focus and unravel. Even though I was diligently taking a salt pill every hour, eating a GU every 6 miles & hydrating, my hamstrings were on the verge of cramping and my legs felt like lead. Matt kept looking at his watch and looking back at me. More than disappointing myself, I didn’t want to disappoint him. I know it’s a tough job as a pacer when the person you are pacing totally falls apart and there’s nothing you can do.We run together so much that I hate it when my bad days slow us down and he patiently waits for me. I knew he wanted to push the pace so we could catch the 3:15 group but I kept telling him I wasn’t ready yet. We ran through the Segerstrom Center for Arts which was interesting before going around the South Coast Plaza parking lot (flashbacks to the New Years half around the Dodger stadium lot). As much as I felt myself fading physically, I tried to stay mentally focused. I knew I wasn’t running as fast as I should be, but I also didn’t want to blow it right then and not be able to finish strong. I was running the best as I could and that was all that mattered to me right then. I kept telling him it was okay if I didn’t do it today and as long as I tried my best, I would be happy. I really needed that second wind to pick me up again. Somewhere along this stretch we ended up passing the 3:15 pacer who looked like hell and was all by himself because his group had left him. A little bit before Mile 20, we hit the Santa Ana River Trail which we would run on for 1.5 miles. From Ragnar SoCal last year, I remember dreading this section because it was so exposed, hot and boring. Fortunately the day stayed overcast and it wasn’t as bad as I remembered. Matt picked off guys in front of us which gave me a target to catch them one by one and kept my mind off the remaining miles. I had heard from different people along the course that I was 4th female so that became my new motivation to keep my place. I was starting to feel better and instead of worrying about my time, I kept focused on chasing down the person in front of me. We ran around a golf course through the Mesa Verde neighborhood towards the home stretch at the OC Fairgrounds. At Mile 25 Matt told me that I would PR today but depending on how I ran this last mile it would determine how big of a PR I was going to get. That last mile seemed to drag on and on since there were so many turns, at one point towards the finish I yelled out “where the F&*K is the finish???”. I saw my watch hit 3:15 but knew I was fairly close to finishing. I had a hard time deciding when to start sprinting because I was worried about collapsing right before the finish and something seizing up so I kept chugging along the best I could until I literally saw the finish line and gunned it. I saw the clock ticking closer and closer to 3:20 and right then I was so determined to get in under 3:20. The clock went past 3:20 but since I was a few seconds off from the gun time, I ended up coming in at 3:19:57, 4th place woman and 1st in age group. 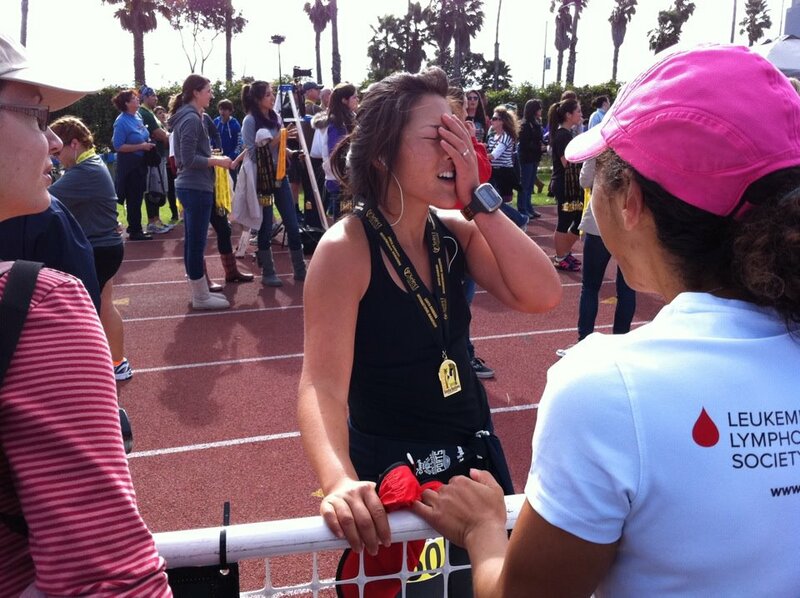 No picture of me almost passing out at the finish line. I didn’t hit that magical 3:15, but I ran the best I could to get there. There was a discrepancy with the race result and overall women’s leaderboard. After some investigating and working with the race director and timing company, they honored my 4th place and took out the woman who had suspicious times. Long story short, cheaters never win and in this sport, it isn’t fair to the rest of us who work and train hard to run the entire race. Most of us run for personal satisfaction and enjoyment and taking that away from other runners is wrong. 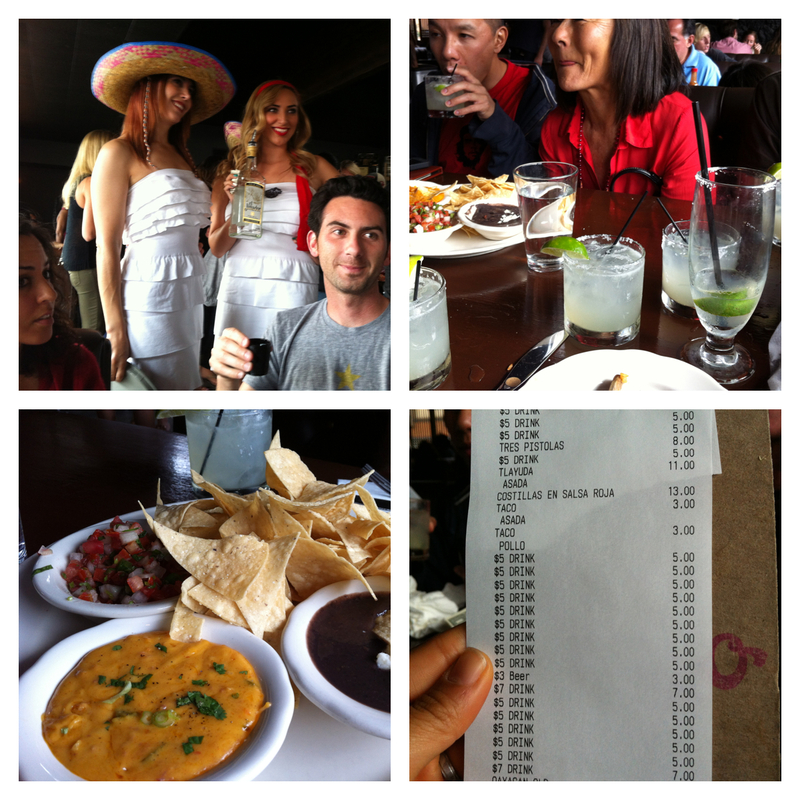 Also, running a marathon on Cinco de Mayo and celebrating with $5 margaritas at a restaurant called CINCO is pretty awesome. Back to the trails I go! Glad you didn’t end up get shorted because of a course cutter. Totally despicable. great job! Love your story! I have not run a marathon since 2011. I have had 2 foot surgeries and need another one but I want to run Boston 2015. I also want to run 3:15! I plan on running the OC this year! Do you plan on running this year? thanks for reading! Not running this year, but it’s a nice fast course for a PR, good luck!